I really like the diversity in the Pierre's Hole course because it exemplifies the riding we have here. We have some great singletrack but we also ride gravel roads, double-track, and pavement in order to link up sections of good trail. You will get a little of everything thrown at you in the Pierre's Hole 50/100 race on August 6th. This is going to be a hard race. 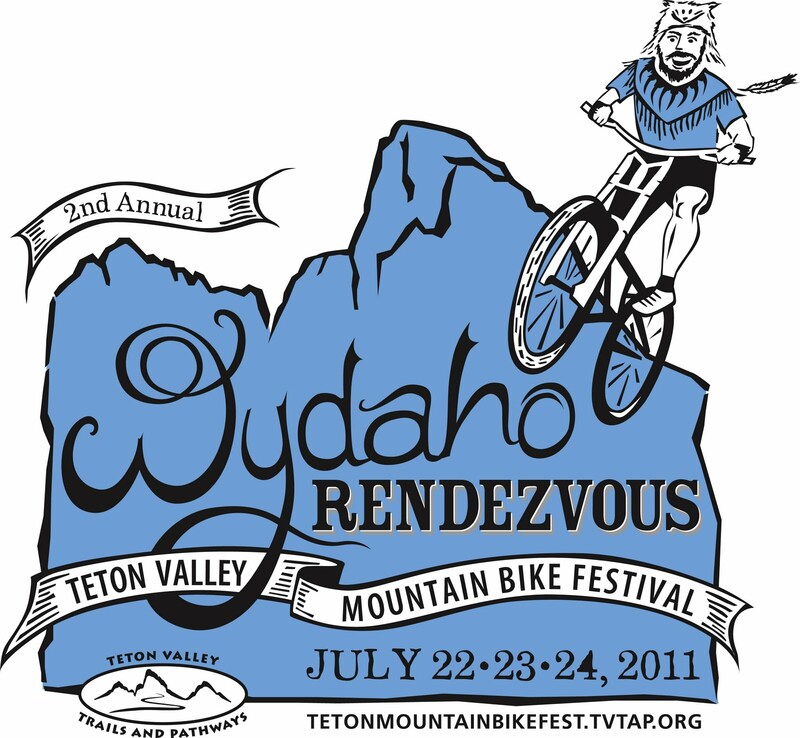 The starting elevation of 8,000', the amount of climbing, and the rugged sections of trail will take their toll on racers. If you don't take care of yourself you will be cryin' for your Momma late in this race. 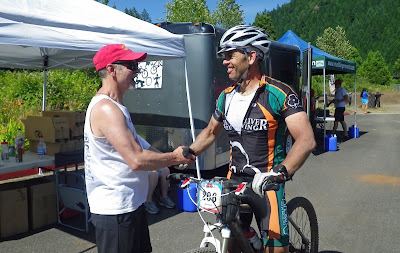 I underestimated the 50-mile version of this race last year and I suffered badly on Lap #2. Wooohoo, that was fun! 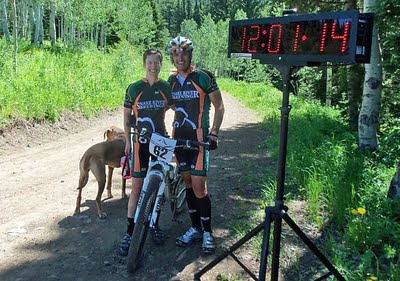 Michelle and I teamed up for the inaugural Targhee 5 Hour lap race this past Sunday and we had a blast. Grand Targhee added a new piece of singletrack late last fall and I didn’t get to ride it before the snow fell so it was brand new to me. We climbed the lower cat track and descended the Lightening Ridge singletrack. The Lightening Ridge loop addition makes the lap about 10 miles and takes roughly an hour depending on how sparkly you are feeling. NOTE: The Pierre’s Hole course will climb the Lightening Ridge singletrack…nice! The 5 hour lap format was a huge hit and I think this race could easily grow if we can figure out the best standalone date and bump the start time back a bit so the Jackson folks don’t have to wake up at 4 AM. Andy Williams always does a tremendous job with course marking, timing, and awards and this was no exception. 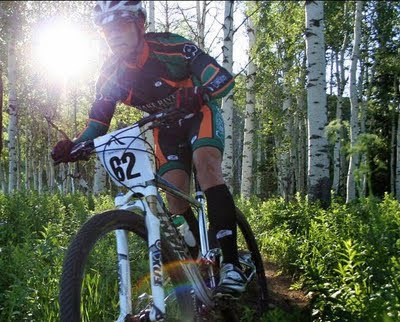 Grand Targhee deserves a BIG thank you for continuing to support mountain bike racing in Teton Valley by putting on races and donating generously to the prizes (more on this in a minute). The race rules state that you have to complete your last lap before 12 PM or it doesn’t count and Michelle and I really wanted to get in 5 laps. The plan was that I would do laps 1, 3 and 5 (hopefully). My first lap was a 54:30 and my second was a 53:42. As Michelle was out on our 4th lap I was getting nervous because I knew it would be close but I was stoked to try and beat the clock. She threw down another consistent lap, we tagged, and I was off with Metalica pulsing in my single ear bud (safety is no accident). I focused on railing the descents and pumping anything that could help me carry momentum. 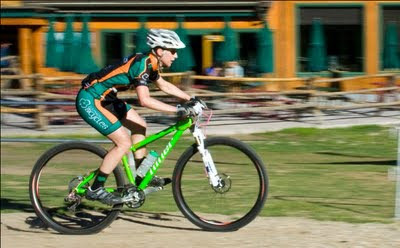 My Giant AnthemX 29er and I were “en fuego”. That last lap went by so fast and I crossed the line in 52:45 and beat the 12 PM cutoff. Team Byers takes 1st...High Fives...Stoked! Speaking of Grand Targhee’s awesome support of races, Michelle and I won two passes for snow cat skiing at Targhee worth $349 each! How cool is that? In addition to giving away four snow cat ski days, there were great prizes from Mtn Khakis and Smith Optics as well. As of July 2010 I had owned a singlespeed for a little over a month but when I finished the Cream Puff on my geared hardtail last year I knew that I wanted to attempt the Puff in 2011 on a singlespeed. I only have two long races under my belt on the SS, and I still have a lot to learn about singlespeed endurance racing, but so far I dig it. I have to admit that I was a little nervous about how I would feel late in this race. Three weeks prior to the Puff I did a six hour training ride with Fiddee Cent in Jackson and we climbed Ferrins Trail three times on our singlespeeds. On that third time up Ferrins, as we were gruntin’ and snortin’ and thrashin’ our way up the hill with a ridiculously low cadence, Fiddee said something that gave me pause. He said, “I’m gonna pray for you” with an unspoken reference to the amount of climbing in the Cream Puff. 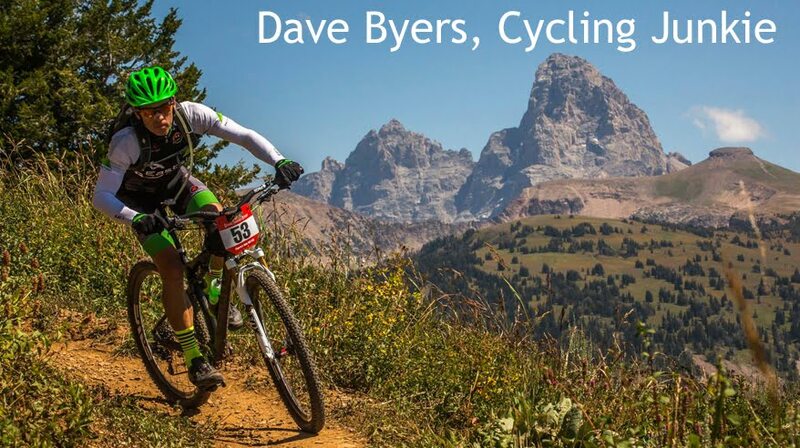 This year’s Cream Puff used the classic 3-lap format which sends you up a long gravel road climb, continues to climb on singletrack into the Jedi Forest, descends a bit, then climbs even more, and finally ends with a ridiculously long singletrack descent on the Alpine Trail…3 times. I have to say that this was by far my favorite course of the four different Puff courses I have raced. Trying to keep up with the fast geared riders on a singlespeed during the 3-mile “neutral” rollout on pavement is pretty comical. In hindsight, I should have sought out a 220 lb linebacker-type and just glued myself to his rear wheel. Ha! My opening climb went great and although I was climbing while standing for most of it I felt like I was within my limits. As usual, my teammate Hami was up the road already and out of sight but I was focused on my race. I yo-yoed with Namrita O’Dea a bit and we broke up the effort with a little chat about her big road trip out west. Even in the cool morning temps I was conscious to drink at least one 24oz bottle of Carbo Rocket per hour plus some EFS Liquid Shot for extra calories. Later in the lap I mixed in a bottle of CR 333 for easy-to-reach calories in the singletrack. The singletrack climbs after Aid #3 were just on the edge of what was rideable for me with my 32x20 gearing but I cleaned all of it which gave me some added confidence. I knew I was having a good day when the trail pointed down at the top of the Jedi Forest and I quickly passed a few riders who had been dangling out in front of me for the past half hour. 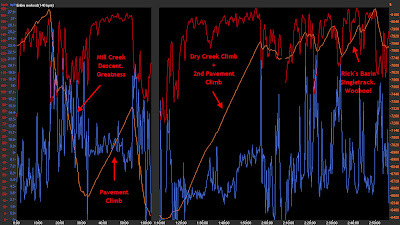 Descending at the Puff had been a weakness for me in the past and I consciously worked on my cornering before this race. I remember saying to myself, “How freakin’ good is this!?! ?” as I was swooping down the Alpine Trail surrounded by giant old growth trees and luscious green ferns. I have to say that the lack of chain slap and overall quietness of the SS doesn’t hurt the descending experience one bit either. My body felt good and my stoke level was high as I rode into Aid #1 at the bottom of Lap #1. The aid stations are so good at the Puff that it would be easy to get sucked into lollygagging in the buffet line. However, I ignored the buffet and found my drop cooler, grabbed two bottles & a gel flask, lubed the chain, and was out for Lap #2 pretty quick. Near the end of Lap #1 I passed my teammate Dave Saurman on the descent. Saurdude made a quick pit as well so we rode together on the North Fork Trail and settled into a climbing groove together up Rd 1910. 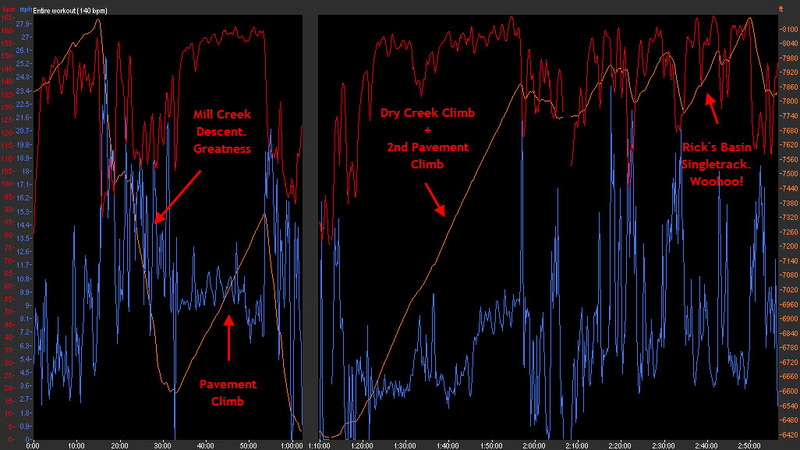 Dave was climbing really well and even mixed up the cadence with some standing climbing. However, I do think it was totally rude of him to ride away from me in his big chain ring when the gravel road pointed downhill for short sections. A polite teammate would have coasted along with me to keep me company since I was spun out. Susan to Ricky Bobby: You need to grab a hold of that line between speed and chaos, and you need to wrestle it to the ground like a demon cobra! And then, when the fear rises up in your belly, you use it. And you know that fear is powerful,because it has been there for billions of years. And it is good. And you use it. And you ride it; you ride it like a skeleton horse through the gates of hell, and then you win, Ricky. Is it wrong that I think of random movie quotes as I am descending at a rapid rate of speed in the middle of a race? I digress. As I began the long climb I could see Hami ahead in the distance climbing out of the saddle. We were running the same gearing so there was no surprise there. I really wanted to try to chase him down but I also knew it was a long lap and I thought I had plenty of time to make my move. Hami had other ideas and I am 99.5% sure that he wants to beat me every bit as bad as I want to beat him. Near the top of the long climb he found another gear and just like that he was out of sight. For the rest of the lap I was chasing a ghost that I was sure I would see around the next corner…but I never did. Hami threw down a great race of his own and beat me by four freakin’ minutes! 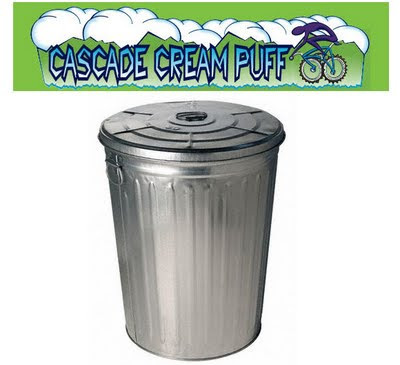 Just to recap, in the last 18+ hours of head-to-head racing (Boise 9 to 5 + Cream Puff), that skinny gluten-free singlespeed hardman has beaten me by a combined 5 minutes. This calls for drastic measures. I am not sure what they are yet but rest assured they will be drastic. What an awesome day of racing! My fourth Cream Puff was by far my best for many reasons that I will elaborate on later in great detail.